R is a free programming language for data analysis, statistical modeling and visualization. It is one of the most popular tool in predictive modeling world. Its popularity is getting better day by day. In 2016 data science salary survey conducted by O'Reilly, R was ranked second in a category of programming languages for data science (SQL ranked first). In another popular KDnuggets Analytics software survey poll, R scored top rank with 49% vote. These survey polls answers the question about scope of R. If you really want to boost your career in analytics, R is the language you need to focus on. If you are skeptical about the scope of R in future, this tutorial would help you clear doubts. It covers some of the great facts about R and why R is considered as the top programming language in predictive modeling and what are the companies primarily using it. 1. 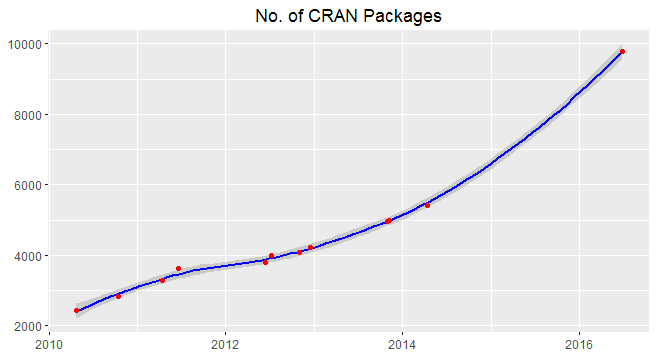 It supports close to 10,000 free packages which adds muscle to R for data science and analysis (CRAN figure as on December 27,2016). In the graph below, we can see the growth rate of packages is very high. It implies more and more people are taking interest in R. I used CRANpackages dataset from Ecdat library to produce this graph. 3. R is one of the highest paid IT skill and holds large share in advanced analytics software (Source : LinkedIn Skills, O'Reilly Survey). 4. Easily integrated with popular softwares such as Tableau, SQL Server etc. Last year Microsoft acquired Revolution Analytics. Post acquisition, Microsoft merged enterprise version of R with SQL server, Visual Studio, PowerBI. 5. New statistical and machine learning algorithms are implemented in R much more quicker than any other statistical tool as R is the first choice of researchers. 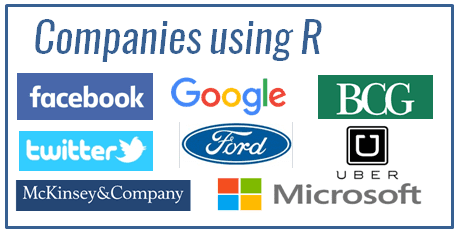 The following is a list of companies using R. It's not a complete list but a sample of the actual population. The data used here were collected from MicrosoftR blog, RStudio, Quora, Indeed job portal and other jobs consulting firms and career community websites. The following is a list of top brands or large organizations using R.
Facebook - For behavior analysis related to status updates and profile pictures. Google - For advertising effectiveness and economic forecasting. Microsoft - Acquired Revolution R company and use it for a variety of purposes. Airbnb - Scale data science. It includes major companies providing IT and professional services using R in India and other parts of the world. The below list comprises of niche analytics companies as well as consulting companies providing analytics or market research services. It includes major US and European Banks, Insurance Companies and Other financial institutions using R.
22 Responses to "Companies using R"
Snapdeal and Paytm also use R for sales and marketing analytics. There is both an R language and a number of particular R programs in which R is used. For instance, there is the CRAN program as well as the MRAN program (others exist as well). So R is both a language and can be considered a program. TIBCO Spotfire has embedded a fully supported and robust version of R for Enterprise usage named TERR (TIBCO Enterprise Runtime for R). A lot of the companies listed here use TIBCO's TERR Engine for running their R Scripts. I like the way you simplify concepts..bring it on !! Thank you for your wonderful insights. This site has been most helpful in my quest of becoming a data scientist. Keep up the good work mate. Hey deepanshu. This is a good Dashboard where you have mentioned these info. I am also working as DA with R and have one curiosity. Can you please let me know in past 1 year which new company has added into this list and which has opt out for this option. Why people can leave using R? We have a Factory which has lot of machines. Machines should always keep running. If any machine goes to down state, it will be a huge impact. We have to design a Dashboard in which, we can see the Color of shape such as “Green - Production, Yellow - Idle, or Red - Down state". Each shape represents a machine and it is either rectangle, square or Bar. Factory image: It has rectangle and bar shapes. Each shape indicates one machine. Backend, we will get the data with ID 1, 2 and 3.
i have 2 machine M1 and M2 .Now the goal is to Register the domain, D1, created in TEA to the second machine M2 So that the domain runs on both the machines. TEA runs on another machine M3. TIBCO-BW-ADMIN-500008: Error in initializing data manager, TIBCO-BW-ADMIN-PRSTNC-500001: Connection to BW Agent failed. The resolution for error TIBCO-BW-ADMIN-500008 is bw agent should be in running state.but both machines agents M1 and M2 are already Running fine. Please let us know how can fix this issue ? I have a problem lately with the filters I have created in Text have created in Text Areas. All the filters directly from the filter scheme seem to disappear for no apparent reasons. On the Filter panel, the filters show up with no errors. This happens when I change tabs but there is no error message showing up. It does not happen all the time. I am not sure what is causing the problem.